Carol Greene was born January 15, 1949 and brought up in Uxbridge Massachusetts. Uxbridge is about 50 miles southwest of Boston. She attended Uxbridge public schools. She was the daughter of Raymond and Rita Greene and also was the youngest of 4 daughters. Her sisters were all athletes and excelled in basketball and softball. However, Carol was the true athlete! While in high school Carol's Father became ill. Carol quit school to help support the family and went to work for Bernat Yarns in Uxbridge. Knowing she would not be able to finish her last year of high school sports, she also understood the importance of helping her Mother during a difficult time. Carol understood the need to finish her schooling and get her high school diploma also and went to school nights. In 1969 Carol tried out for The Waltham Drifters. This was a fast pitch team that played in the Eastern seaboard league. That league was considered the top fast pitch league in the country during that time. Carol was a left fielder. The team traveled extensively throughout the United States and Canada. In 1972 the team qualified for the Amateur Softball Association Women's Fast Pitch Nationals that was held in Tucson Arizona. 64 teams from all over the country were there to play. The Drifters played their way into a 5th place finish. Carol was selected as an All-American for her standout play in the tournament. She often said that it was the highlight of her athletic life and something she would cherish forever. As with all athletes it came time to retire and focus on a job and other interests. Carol became a supervisor for shipping and receiving for Ethyl Corporation. It was sometime during this period she decided she wanted to play billiards. While the pool hall was considered a “man's domain", that was nothing to her. She went to the pool hall and quickly became accepted by the guys. Her team won the states and off she went to the National Tournament. As time went on the decision was made to move to The Villages. It was a big move for the country girl from Uxbridge. However, she found a group of men and women here that loved billiards as much as she did. 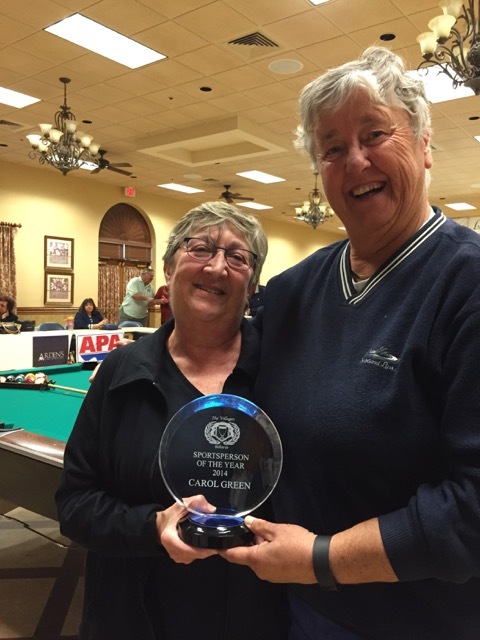 Carol was an excellent player and enjoyed the competitive spirit and friendships she made. She also enjoyed helping new players improve their games. She loved the men and women in the Billiards Club. All of you were dear to her and she loved nothing better then to make you smile or laugh with her quick wit! I will never forget the outpouring of love and support for me after Carol's sudden passing. The Billiards Sportswoman of the year award would have been beyond her imagining! She was impressed with all of you and was grateful to be playing with you in The Villages.